Super clear intergrown quartz cluster has selectively drusy-ied areas and drusy covered dark chocolate colored iron deposits, intense natural etching, clear golden healer crystals and more on a crystal plate bottom. Four twin sets, other penetrators. Big rainbows. One consumed twin has a double face, one prism. Two fully faced, admittedly odd and perfect nubbins. 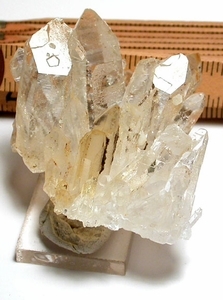 One crystal with two cleaved faces. 2-1/4"x 2-3/4"x 2" vertically, a sparkling specimen for your cabinet of curiousities.